To get the most out of the workshop, participants will need to bring a laptop that can connect to the Internet. 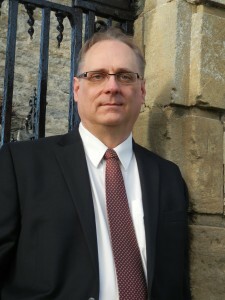 Eric Meyer is Professor of Social Informatics and Director of Graduate Studies at the Oxford Internet Institute, a multidisciplinary department at the University of Oxford which undertakes teaching and research focused on understanding life online. Eric’s work focuses on shifts in work, knowledge creation, and human interactions when digital technologies replace previously non-digital counterparts. His research in this area has included studies of the impacts of digital collections in libraries and museums, digital practices in the arts, the use of digital images in biology, and digital information practices in the sciences and humanities. In this talk, Eric Meyer will discuss his 2015 book Knowledge Machines: Digital Transformations of the Sciences and Humanities, in which he and his co-author Ralph Schroeder argue that digital technologies have fundamentally changed research practices in the sciences, social sciences, and humanities. Meyer and Schroeder show that digital tools and data, used collectively and in distributed mode—which they term e-research—have transformed not just the consumption of knowledge but also the production of knowledge. Digital technologies for research are reshaping how knowledge advances in disciplines that range from physics to literary analysis. This book considers the transformations of research from a number of perspectives, drawing especially on the sociology of science and technology and social informatics. It shows that the use of digital tools and data is not just a technical issue; it affects research practices, collaboration models, publishing choices, and even the kinds of research and research questions scholars choose to pursue. Knowledge Machines examines the nature and implications of these transformations for scholarly research. Alan Liu began his talk with a quote from Finnish architect Eliel Saarinen: “Always design a thing by considering it in its next larger context”. With this in mind, he chose to focus on Digital Humanities cyberinfrastructure as a sub-domain of Humanities infrastructure, and to look at how Digital Humanities can support traditional Humanities fields. 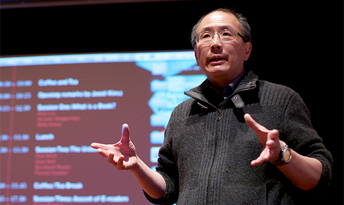 Liu argued that the Digital Humanities has a tradition of critiquing infrastructure, which is not only unique to the field, but the best mechanism for supporting traditional modes of criticism. This is because infrastructure has the same impact on individuals and communities as culture – it makes up our environment and how we interact with each other. Liu used dystopian films as an example, pointing out that whole cultures in these films are dominated by the infrastructure that is available to them. In Blade Runner, for example, flying cars make up the environment, where as in Mad Max the world is driven by fuel. Today culture could be said to be shaped by smart phones, social networking, and big data. By critiquing these systems, Digital Humanists can add to the larger debates surrounding culture while remaining in the digital sphere. According to Liu, the current style of Digital Humanities critique is “lightly anti-foundationalist”. He cited James Smithies, Michael Dieter, Bruno Latour, Ackbar Abbas, and David Theo Goldberg as examples of this, arguing that while Digital Humanists believe in the potential for known and trusted digital tools and methodologies to provide new insights in the field of humanities, they are also distrustful of them. This is evident in Digital Humanists’ tendencies to ‘hack’ – where hacking in this context means using the skills and tools one understands and has at hand rather than investing in more formal forms of infrastructure. To Liu ‘hacking’ gives the Digital Humanities a unique perspective: it allows the field to be efficient and flexible, and to get close enough to systems to understand their weaknesses without being vulnerable to them. In order to move forward, Liu suggested that Digital Humanities should adopt what he calls ‘Critical Infrastructure Studies’, the formal study of academic infrastructure in its relation to larger society, which he sees as the Digital Humanities’ mode of cultural studies. Liu suggested two approaches to Critical Infrastructure Studies: the Neoinstitutionalist approach to organizations in sociology, which explores how institutional structures and norms influence the decisions and actions of individuals in the institutions; or Social Constructionist (especially Adaptive Structuration) approaches to organizational infrastructure in sociology and information science, which would investigate how the interactions and connections between people can construct beliefs and understandings of the world, and how these interactions can affect our perceptions and use of particular technologies. Liu believes that these approaches would help Digital Humanists to create new academic programmes and roles, and to advocate for the creation of national collaborative infrastructures, opening up research data to wider audiences. Revisiting the quote from the beginning, Liu suggested that the work that Digital Humanists put into shaping academic infrastructure will have a bearing on other organisations and the community at large. This is where Liu’s title for this talk – Against the cultural singularity – comes into focus, for he argues that the current neoliberal capitalist thinking is creating a ‘cultural singularity’. He defines this as an environment where all parts of cultural are capitalized and brought under a corporate framework. Liu argues that society would be stronger if institutions adopted their own metrics of value and success, and used these metrics to make decisions about infrastructure. He believes that by critiquing infrastructure, Digital Humanists can resist the neoliberal model and offer alternatives. 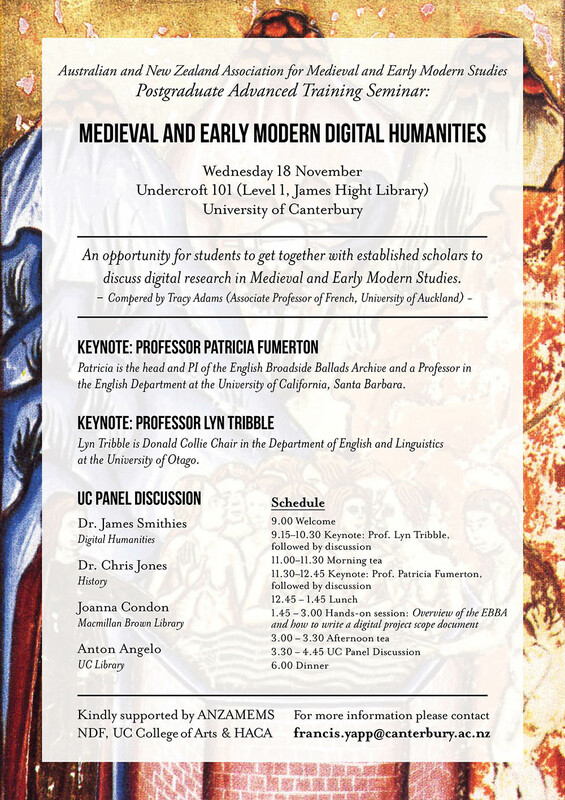 A few weeks ago I attended an afternoon of short seminars about Digital Humanities cyberinfrastructure held by the Digital Humanities Programme at the University of Canterbury. Speakers included Dr James Smithies, Director of the UC Digital Humanities Programme and Co-Director of the UC CEISMIC Programme; Dr Alan Liu, Professor in the English Department at the University of California, Santa Barbara, and an affiliated faculty member of UCSB’s Media Arts & Technology graduate program; and Paul Arthur, Professor and Chair in Digital Humanities at Western Sydney University. The aim of the workshop was to begin an informal discussion on national and international Digital Humanities cyberinfrastructure – what tools and resources exist presently; how can we better leverage and improve them; and how can we advocate for their funding and development? James Smithies was actually the last to speak at the event, but I felt that his talk was a good introduction to the topic of Digital Humanities cyberinfrastructure, so I have decided to reverse the order in my blog posts. His talk was drawn from the first chapter of his upcoming book, The Digital Modern: Humanities and new media for Palgrave Macmillan. Smithies began the talk by discussing the politics of cyberinfrastructure. He identified Our Cultural Commonwealth – a report by the American Council of Learned Commission (ACLS) on Cyberinfrastructure for the Humanities and Social Sciences – as one of the initial attempts to charter opportunities for computationally intensive Humanities research. This report, like many early models for DH infrastructure, borrowed much of its mode of thinking from the STEM fields. It stated that, “computers should be used by scholars in the Humanities, just as microscopes should be used by scientists” (Our Cultural Commonwealth, 2006: i). In other words it is as important to invest in infrastructure in the Humanities as it is in Engineering, Maths, and Science. Smithies argued that this STEM-based model caused tension in the Humanities, as many digital projects were given large amounts of money over more traditional projects. When these digital projects failed to deliver their promises, this infrastructure model began to generate criticism. Patrick Svensson, for example, argued that the allocation of space and the ability to collaborate with people in and outside the Humanities department is as important to Digital Humanists as computers and information systems. Feminists also called for more inclusive data models which would take into account gender and ethnic inequalities. Susan Leigh Star argued that infrastructure should be evaluated in ethnological terms, in that it does not only represent tools or resources that we can use, but also the values and norms of the culture that created it. She argued that infrastructure is created to serve particular types of people and practices – in essence, infrastructure is political in nature and it is the task of Digital Humanists to challenge the preconceived notions of what infrastructure is and can be. The problem with challenging the status quo is that the Digital Humanities community does not currently have a strong concept of what that is. Smithies suggested that the first step in analysing and critiquing Digital Humanities infrastructure would be to identify the cyberinfrastructure that already exists. He suggested using a systems analysis approach, borrowed from the STEM fields, to provide an initial overview of the current state of global cyberinfrastructure. Smithies further argued that Humanists’ investigation of infrastructure should go right down to how the tools are made and whether they mirror Digital Humanities values such as openness and net neutrality. Eventually, he hopes that systems analysis will move from a model to a genre – a collection of approaches for analysing systems which reflect a multitude of values and perspectives. Walsh will continue her discussion on these workshops next week. 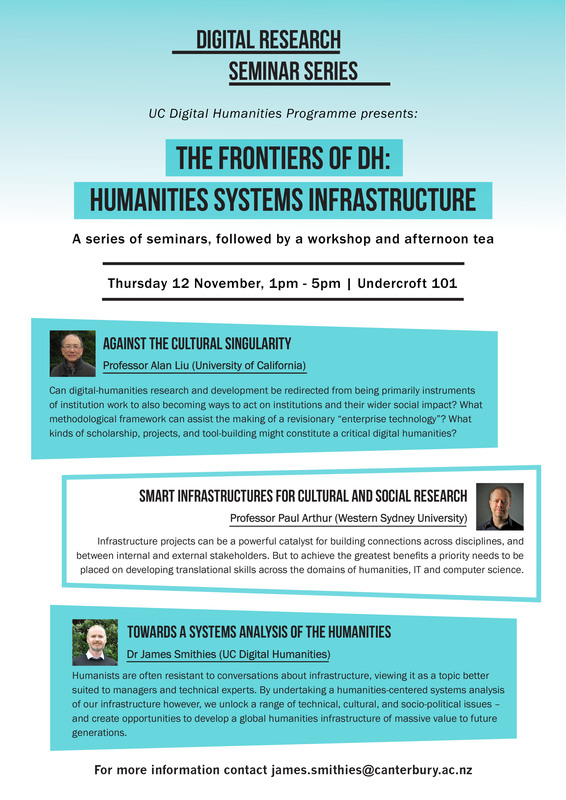 This Thursday 12 November the UC Digital Humanities programme is hosting an afternoon of short seminars, followed by a workshop, centered on humanities systems infrastructure. Please note the venue has changed to Undercroft 101. The time is still 1pm – 5pm. The goal is to start thinking about what humanities systems infrastructure is, what it might become, and what values and goals should be used to develop it. The workshop is low-key but might be of interest to researchers interested in digital research and the politics of infrastructure, GLAM and university professionals with responsibility for digital strategy, and IT professionals with interests in the cultural heritage and research sectors. Speakers have been allocated 45 minutes but we’ll take a relaxed approach to timing. Input is strongly encouraged from all attendees. 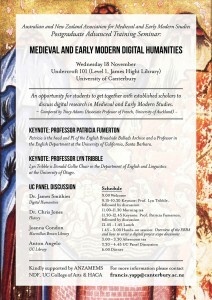 1.00 – 1.15: Introduction by Dr. James Smithies, University of Canterbury Digital Humanities Programme. 1.15 – 2.00: Prof. Alan Liu, University of California at Santa Barbara, ‘Against the Cultural Singularity’. 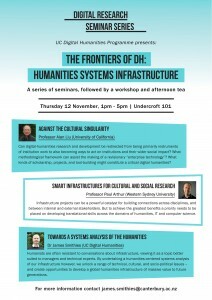 2.00 – 2.45: Prof. Paul Arthur, University of Western Sydney, ‘Smart Infrastructures for Cultural and Social Research’. 2.45 – 3.30: Dr. James Smithies, University of Canterbury, ‘Towards a Systems Analysis of the Humanities’. 3.30 – 4.00: Afternoon tea. The session will be followed by an open meeting on Friday 13th November, 10am – 12pm in Karl Popper 414, to discuss possible actions and outputs. The 3 keynote seminars will be videoed. A video recording of Tim’s seminar at UC on Wednesday 21 October. To kick off a 6-week Festival of Digital Humanities, our visiting Fulbright Specialist Professor Alan Liu (University of California, Santa Barbara) is presenting the first in a series of seminars and workshops, tomorrow (Wednesday 28 October) at 4pm. Professor Liu is a highly distinguished figure within Digital Humanities circles, and we are privileged to have him at UC as a Fulbright Visiting Specialist, thanks to the generous support of the Fulbright Scholar Program. How do such key methods in the digital humanities as data mining, mapping, visualization, social network analysis, and topic modeling make an essential difference in the idea of the humanities, and vice versa? Using examples of digital humanities research, Alan will speculate on the large questions that confront the humanities in the face of computational media – most importantly, questions about the nature and function of interpretive “meaning”. Coming up this Wednesday 21 October is a seminar by special guest Dr. Tim Sherratt. Dr. Sherratt is well known in the field of digital humanities, and recently received a standing ovation for his keynote presentation at DH2015, the annual international conference of the Alliance of Digital Humanities. In his own words, Dr. Sherratt is a historian and hacker who researches the possibilities and politics of digital cultural collections. 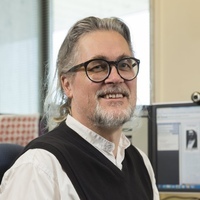 He has been creating online resources relating to archives, museums and history since 1993, and is currently an Associate Professor of Digital Heritage at the University of Canberra, while also co-managing the National Library of Australia’s Trove database. Sherratt is a member of the THATCamp Council, an organiser of THATCamp Canberra, and a committee member of the Australasian Association for the Digital Humanities. Digital research infrastructure is typically understood as big and expensive, but some of our most valuable tools live in the GitHub accounts of individual coders. Investment in digital infrastructure and coding education tend to be framed in the language of innovation and large-scale ‘disruption’, and yet DH offers a more critical and reflexive path based around small-scale interventions. DH encourages us to share, to do our work in public, and yet…these are not simply matters of policy or strategy. They are real moments of uncertainty in the lives of individual DH practitioners. How do we help? How do we build an infrastructure aimed not at lofty national goals, but at supporting people who want to do things differently?